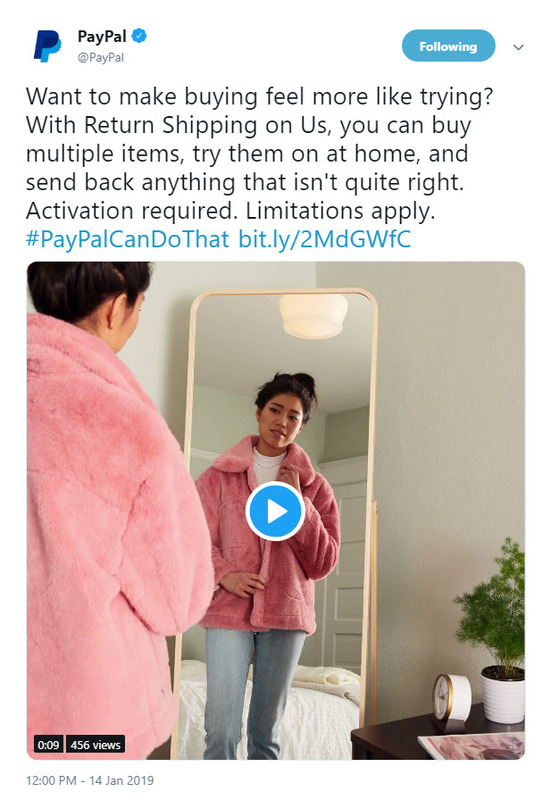 PayPal is actively encouraging shoppers to buy multiple quantities of an item they want with the idea of returning all but one. That may be okay for some retailers, but it's not for everyone, especially given the ever-increasing cost of return shipping. "Want to make buying feel more like trying? With Return Shipping on Us, you can buy multiple items, try them on at home, and send back anything that isn't quite right. Activation required. Limitations apply. #PayPalCanDoThat http://bit.ly/2MdGWfC "
It's not quite "wardrobing," the practice of buying items, wearing them with the tags, and then returning them - which according to Findlaw.com can be fraud, depending on a store's policies. But it takes the PayPal program, which is not new, from one that makes shoppers feel comfortable returning an occasional unwanted item to encouraging them to engage in binge-returning. The tweet ultimately lands shoppers on this page that describes the Terms and Conditions of "Return shipping on us." In theory, it's nice of PayPal to pay for return shipping. But there "holes" in this current campaign. It reminds me of a friend that sold a lot of doll clothes on eBay. The buyer decided they wanted to return the lot, BUT only returned 80% of the items. The seller was smart and she sent a note that she received a portion of the lot and if asked when the 2nd package for the balance of the items will be returned. The buyer did stated that she like and took a few pieces that she wanted to keep, but wanted full refund. The seller did not refund and she blogged about her fraud with name and city she is in. It's bad enough that buyers buy equipment just to pirate parts and then return the item for refund. None of PayPal's business. Remain a payment agent/transmitter and stay out of your customer's areas of expertise. Smells a bit like an eBay ex CEO meddling.. I read through all the terms, and the important points are you can make 12 requests during a calendar year, the maximum refund you can receive per transaction is $30, and you have 150 days to file a Shipping on Us request. It's bad enough that eBay encourages buyers to return their items, and now PayPal is willing to pay buyers to return them. The link above that reads "this page" leads to a Paypal headed message that says "something's not right". That short of sums it up. Why are these companies so obsessed with returns? It feels like they are pushing returns more than keeping the item. Ebay first thing on purchase history after delivered is "RETURN THIS ITEM"
Because each transaction generates income for them, in the form of fees, or at the very least, inflated GMV, which can then be used to bolster claims of growth. Especially 'effective' if the return item value isn't deducted when reporting that sale metric to investors. And in most cases, the returned merchandise can be resold (creating another $ale opportunity) without need to re-acquire inventory. But wait! That's not all! As an added bonus, the 'pusher' can misdirect that self-serving motive by wrapping it in a claim of altrustic buyer friendliness. Income without cost; like printing money. Well, there is a cost of course. To the seller. But since when did any venue or processor give a sheckel of care about that? Good Lord - what's next? I've been selling on ebay since end of 1999 / start of 2000, this has happened multiple times to me. I recently sold a lot of 80's LEGO blocks. Buyer cherry picked the good rare pieces and returned the bulk common pieces. Nothing new. Unbelievable and why should PP care. So someone buyer a dozen coats which pretty much uses up all their transactions for the year as well as most likely going over the $30 limit each time. Since we know that buyers don't read, they aren't going to be reading the fine print that PP would be putting out, so who will get left with the negative feedback when some ninny tries this and ends up not get the results that they want? It won't be PP or eBay, it will be the various sellers who were not a willing participant in this theft. Paypal as a way to take payments is on its last leg. 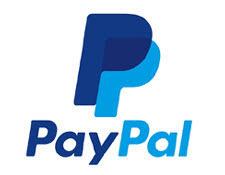 Sure paypal is a strong brand and large retail stores will use it, but to the little guy it is only going to be about sending payments and not receiving them, Ones ebay drops paypal then it will be nothing more then a payment option at checkout when you buy. Policies like this will probably aid the consumer more then harm the seller. Paypal: Stay in your lane. I used ''Return Payments on Us'' just last week. I ordered a backup camera and it came in broken. The seller agreed to take it back as a return, but offered no return label, as they generally don't accept returns. Instead of hassling him about it, I just sent it on my own dime, and then submitted the cost to PayPal on their program. Just got reimbursed yesterday. To my knowledge, the program was created to help buyers in that situation, but you have to sign up ahead of needing it, not after the fact. It's easy to do. How it has been convoluted into a tool for a buyer to purchase an array of products and return all but one, I have no idea. Certainly a flawed plan. Oh this is going to be fun in the European Union with our draconian consumer laws which already encourage buyer wardrobing and fraud. why is it that such crazy business practices come from California? such a practice actually drives sellers off internet sales and that is where amazon and eBay make their money! crazy! It will be a cold day in hell before I keep jumping through "desperation hoops " in order to make a dollar. I have stopped selling on ebay for now. In all conscience, I could never rake a seller over the coals. PayPal is getting loopier. Managed payments will only make things worse. I miss my "little kitchen table seller" ways. Didn't PP have "stores" like Ebay? Are they going back into the "store" business? I don't understand this encouraging buyers to go "Amazonization" and buy a box of clothes, try them on and return the ones you don't want. Who gave PP that authority to speak for selling sites? Many of these companies were begun in California and are headquartered there. California is ahead of the curve in innovation - unfortunately, after the innovation takes place, the MBAs and lawyers and various marketing critters get in on the act (and that can happen anywhere, and does). Training customers to be criminals need to stop. we need to be teaching and conditioning them that there are REAL people selling this stuff, not faceless corporations with billions because they can pay slaves in china 10 cents a day.